As an avid crafter, I have no shortage of craft ideas in my hopper to try next (hard to imagine life before Pinterest). I have come to the realization that just because I treasure handmade, it doesn’t mean I have to make everything. My craft room is only so big! I’m suggesting that, rather than DIY, let’s promote BIY (buy-it-yourself) once in awhile. Save yourself the time and shopping cart full of materials for one single project that – let’s be honest – may or may not ever get made, and support other crafters. It’s a win-win! Today’s post is all about finished cross-stitch. Cross stitching is a lot of fun, and can be extremely relaxing. Unfortunately, however, completing a beautiful work of fiber art can take months or even years! Why not spend a little extra money and get instant gratification? Plus, you’re supporting another fiber artist for all their hundreds (or thousands) of stitching hours. Here are some fabulous stitchers that would love to share their handiwork with you and save you the time of having to do it yourself. 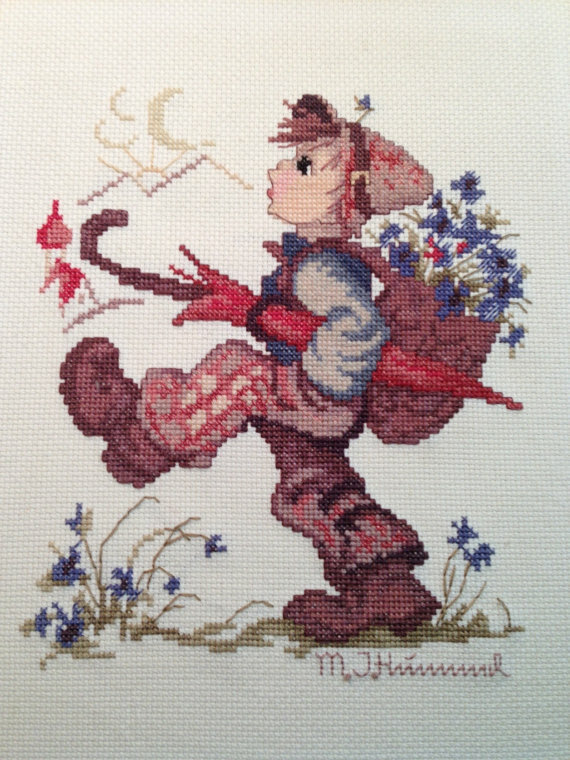 AnnsAntiqueTreasure is offering this finished Hummel Boy for less than $15 – fifteen dollars!!! You probably couldn’t even buy fabric and DMC floss for less than that. 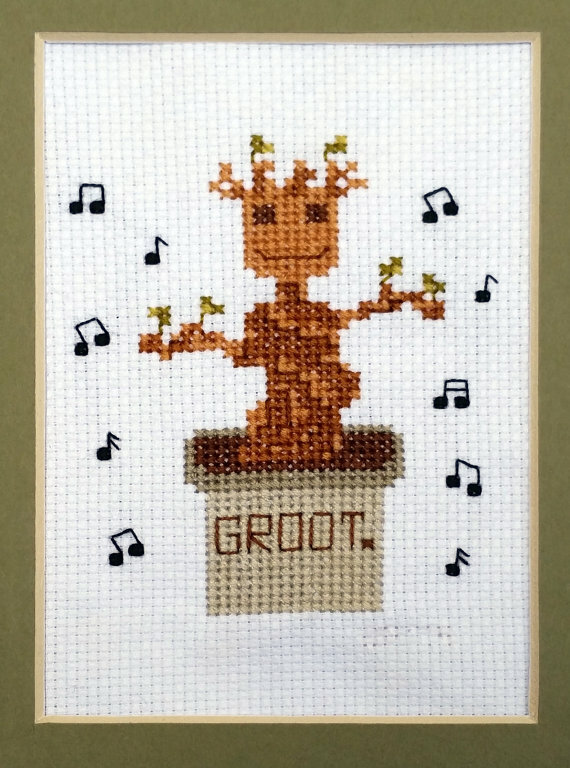 Ohhhhhhhhhh, cute dancing baby Groot available at EpicStitchery. SO cute! This would also be a great gift idea! 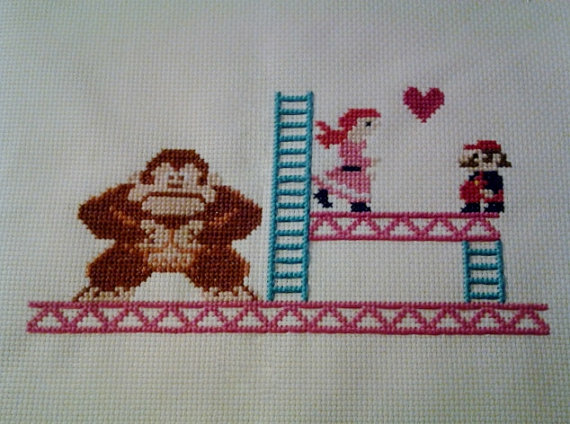 I love this darling Donkey Kong, Mario in Love piece from HappyHaikuCrafts. This takes me back to childhood for sure. Looking for a new twist on an old classic? 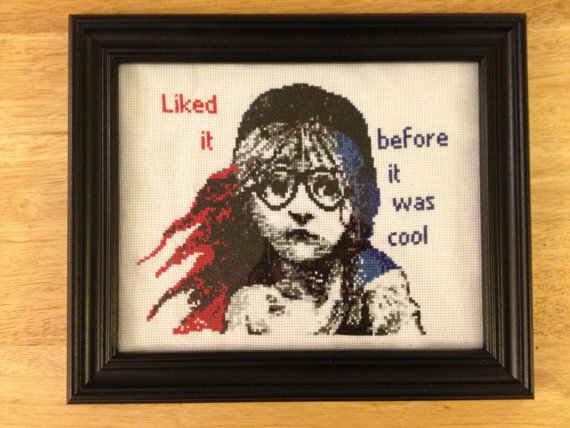 How about this Les Miserables Hipster Cosette from StephXstitch? For $175, it even comes framed. 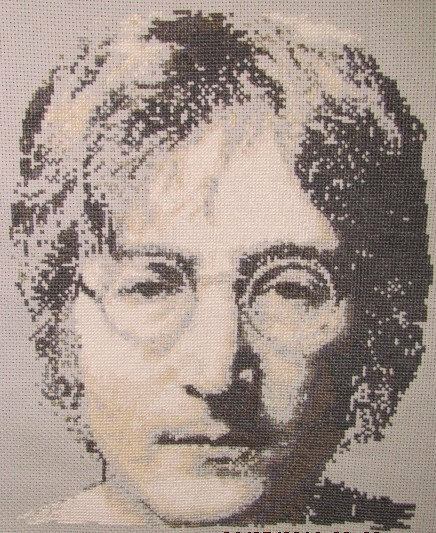 I really like the greyscale look in this John Lennon piece by Christicrossstitch. There are lots more celebrity pieces available as well. Of course, I would be remiss if I didn’t include my own stitchy work. Here are some of my completed pieces, each one available on Etsy. This is one of my favorite pieces. 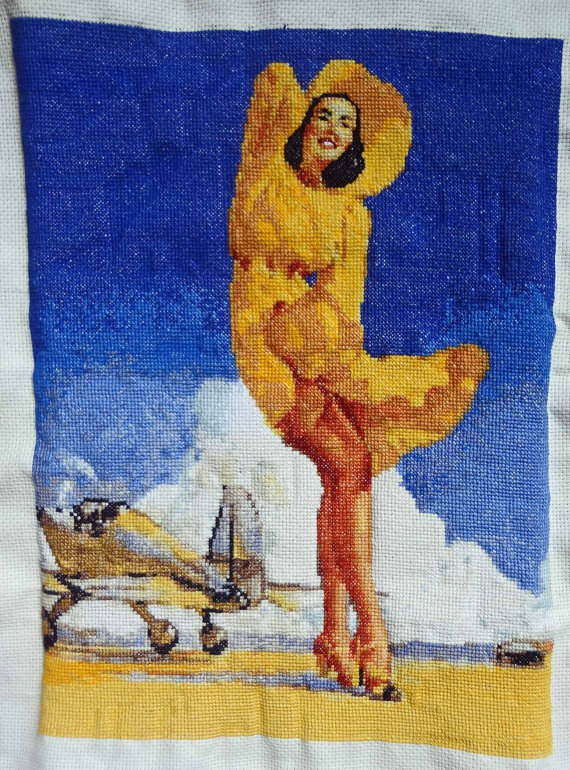 It’s a high-flyin’ pin-up with airplane in the background. It measures about 14×10 inches and is ready for framing. The price has just been reduced to just $100! 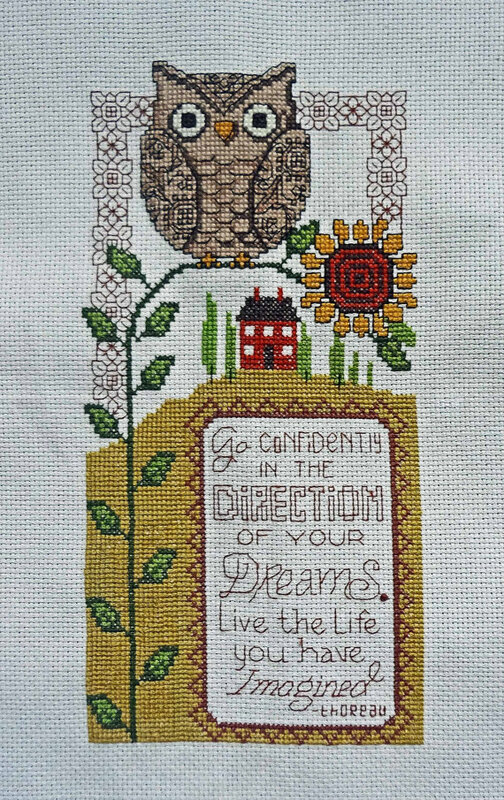 Go in the Direction of Your Dreams with this darling owl cross-stitch. 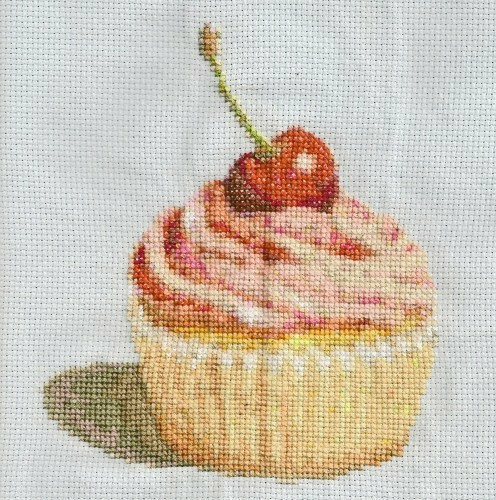 There is nothing quite as sweet as this cherry cupcake cross-stitch piece. I stitched it on a soft blue Aida cloth, and it brings out the sugary sweetness of the pinks and reds within the cupcake. Still want to stitch something yourself? Well, you have come to the right place! I have the largest cross-stitch shop on Etsy and have over 300 unique, handmade patterns ready to download. You can visit my shop here, or convo me regarding custom designs. I also have a sale going on there too – buy 3 patterns, get 3 more FREE! It’s the perfect time to stock up on lots of great projects! Thanks for stopping by, and happy stitching! Previous postKick Up the Caffeine – It’s Back to School Time!